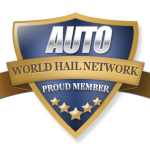 The Auto Hail Repair Industry uses many terms and has even coined a few. Learn some of the actual language used by the technicians in the hail repair field. Note: Feel free to link your website to this page, but do not copy any of the information. As with the entire site, it is copy-write protected. Access – refers to being able to actually get to a dent for repair. Adjuster / Adjustor – a person who specializing in estimating hail damage. Aluminum – refers to the type of metal that the car panel is made with. A-Pillar – The post that runs down along the sides of the windshield in front of the front doors. Appliqués – The vertical area between the doors (usually Black). Auto Hail Damage – Any damage that is caused by storms which drop hail stones. Auto Hail Repair – The process of repairing or replacing any materials damaged by a hail storm. Base Coat – The color layer of the painting process. Battery – Used to power dent lights and glue guns. Learn about battery safety. Belt Molding – The trim at the base of the window glass. Black Plague – PDR Crease Tabs for glue pulling. Blehm – A manufacturer of quality dent repair tools. Original owner of A-1 Tools. Blending Hammer – A tool used mainly for blending dents and fine tuning high spots during the PDR process. Block / Sanding Block – A square block used to lightly sand the clear coat layer to help smooth repairs. Body Filler / Bondo – The putty like substance that body shops use to fill in dents. Body Line – The bend in the metal panel for added strength and/or appearance on a vehicle. B-Pillar – The support posts between the front and rear car doors. Brace – Reinforcement behind the panel to add strength and rigidity. Brace Tool – A specially designed tool to slide between a brace & the panel skin for removing dents. Brake Light / Tail Light / Tail Lamp – The red lights on the rear of the vehicle that light up when stopping. Cherry Picker – Nickname for a technician that grabs the easier to repair vehicles when working wholesale deals with other technicians around. Clear-Coat – The top layer of paint that is applied to cover and protect the base coat. Corrosion – The act of metal rusting. Corrosion Protection – A spray or brush applied protective coating used to re-seal any scratched painted surfaces. C-Pillar – The support post that runs along the sides of the rear windshield. Cracked Paint (Ouch! – Hard for a dent guy to even type) – Paint is brittle and can crack either from the impact or from too much force during a repair. Crease – A long narrow dent. Cross-checking – The act of looking at the dent from various angles to ensure a complete repair. Deck-lid – The car part that covers the vehicle’s trunk. Also known as a boot in some countries. Dent – When metal is bent out of shape, the depression is known as a dent. Dentcraft – A very reputable paintless dent tool manufacturer and supplier. Dent Glue – Special hot melt glue used in the process of glue pulling. Dent Repair – The act of reshaping or filling the metal to bring the dented area to pre-damaged condition. Dentless Repair – What a lot of people call paintless dent repair. Dent Wizard – One of the largest and oldest paintless dent repair companies. Ding – A term used to describe a small dent. Double Brokered – When there are two middle men between the work and the tech taking a percentage. Double Panel – When a vehicle panel is more than normal bracing and over 50% inaccessible it is known as double paneled. Drill / Drilling – The act of creating a hole used for access. Drip Molding – The long moldings that run along side the rail on the edge of the roof. Fade – Refers to the workable area of a dent lights reflection. Fender – The vehicle part that covers the front tires. (Next to the hood) Also known as a guard in some countries. Fender Liner – The plastic cover around the tire opening the protects the underneath side of the fender panel. Flat Spot – An area of the paint lacking orange peel, usually after wet-sanding. Glass / Like Glass / Glass it out – A term used by many dent technicians for extremely good repairs. Glue Pull – The method of pulling a dent rather than pushing it from the backside of the panel. Glue Tabs – The plastic piece that is glue to the vehicle used to pull a dent out. Gravy – Slang term for easy to repair damage. Usually dime sized shallow dents. Hail Stone – The actual ice ball that falls to the ground. Hail Dent – The impression left in the metal from the hail stone’ impact. Hail Strike – When a hail storm hits an area, it is referred to as a strike. Also a company specializing in hail maps to track and find hail damage. Hand Tools – Short tools used more for muscling a dent versus using leverage. Headliner – The interior panel above the passengers below the roof of the vehicle. High Spot – When the metal is pushed past level, it is known as a high or a high spot. Hood – The panel that covers the engine compartment in the front of the vehicle. Also known as a bonnet in some countries. Hood Clips – Little plastic retainers that hold the insulator pads in place. Hood Stand – A device designed to place hoods and deck lids on to make repairs easier. HSS / High Strength Steel – Super strong and lightweight metal used in the manufacturing of car panels. Inventure – A Florida based dent tool manufacturer. Insulator Pad – Heat resistant cover under the hood or deck-lid. Keco – A popular brand of glue tabs. Knockdown / Tapper – A small device used to tap high spots. KHS / Know How Systems – A hail catastrophe company. Laminated Glass / Laminated Window / Double Paneled Glass – Windows that have two thin panes of glass instead of one thick one. L.E.D. / LED Light – A light-emitting diode (LED) is a semiconductor light source. Dent lights are switching from fluorescent bulbs to LED. Light Board / Reflection Board – A small panel used for PDR to show highs, lows and imperfections. Low Spot – An area of a dent that is not brought up to level. Matrix – A reference guide used to determine PDR hail repair pricing estimates. Micro-Fracture – Paint cracks that are not visible to the naked eye. Mini-Lifter – A device used to pry up glue tabs to remove dents. Mini Light – A small (usually 12-18 inches long) version of the dent light. Mobile Tech Expo / MTE – The largest recon show for the appearance repair and reconditioning pro. Mound / Mounded – When a dent is evenly pushed or pulled past level. NAPDRT / National Alliance of PDR Technicians – A group of technicians working for the betterment of the PDR industry. Oil Can – When the metal is so stretched that it cannot be put back into place. Open-Area – An area of a car panel that is not double paneled or braced. Orange Peel – Paint is not smooth but bumpy like the peel of an orange if you get a close look under proper lighting. Oversized Vehicle – This refers not only to actual size of the vehicle but also extreme heights. PARS – A large hail broker based in Colorado. PDR Linx – A large hail broker based in Texas. Pitted – When a dent is almost completely removed except for a tiny area it is known as pitted. Pizza / Cookie / Oatmeal / Chicken Skinned – Terms used to describe bad or chewed up dent work. Plugs – Plastic discs used to seal up a hole. P.O. / Purchase Order – The number on a document used to approve, track and process purchased items and services. Primer – The first layer of paint used to seal the body filler before the base coat is applied. Pulled Paint – When glue pulling a dent, sometimes the paint stays on the tab instead of the car. Pull it – Lingo used to refer to glue pulling versus pushing a dent. Quarter / Quarter Panel / QTR – The vehicle panel that covers the rear tire. Next to the deck-lid. Rail – The thin panel above the doors that connects to the roof. Reflector board – Instead of using lights outdoors, many door ding technicians use this to see a reflection for fixing dents. River / Valley / Railroad Tracks – The line that is left running through a repaired dent when it is removed without cross-checking. R.O. # / Repair Order Number – The reference number assigned to a vehicle by a body shop, dealership or other fleet operation to track vehicle repairs. Rod – A long metal tool used to push dents out with the use of leverage. Rows / Corn Rows – More terms used to describe rivers. R and R / Remove & Replace – This is the actual process of removing a damaged part and replacing it with an undamaged one. Sail / Sail Panel – The triangular panel behind and above the rear door that runs along the rear windshield. The sail connects the rail to the Qtr panel. Sand – Wet-sanding or color sanding with super fine sand paper. Upper Sash or Scalp Molding – The molding that runs along the top of the window on a door. Shadow – Just like your own shadow, but this one shows where the high spots are during a dent repair. Slide Hammer – A weighted device used to pull dents either with glue pulling or conventional repairs. Smoked – Referring to a panel or vehicle with severe amounts of damage. Almost not repairable using PDR. Stretched – When the dent reaches a certain depth, the metal is pulled which may result in oil canning. Sunroof – The glass window in the roof of the vehicle that retracts. Sunroof Assembly – The glass and entire track that it moves in. Taco / Folding – The questionable method for removing a headliner without taking down all the pillar trims. Tag-Team / Splitting cars – When two or more technicians work together on the same vehicle while repairing hail damage. Technician – Person performing the repairs. Known as a tech for short. Tech Sheet – Either paper or digital spreadsheet used to track the vehicles that a technician repairs. Tool / Dent Tool – Any device or rod used to remove a dent. Typical Dent Guy – When spotted in their natural surroundings they are usually seen wearing flip-flops, camo shorts and an affliction shirt. Ultra – Ultra Dent Tools, Inc is a tool manufacturer and supplier. Whale-Tail – A dent tool used repair dents in braced areas. Wedge – A long triangular-shaped piece of plastic used to gently spread the window opening apart. Window Guard – Lexan, steel or plastic sheet used to protect the glass window on the doors. Winter Work – Dents that may be repairable, but would take too much time and cost to much money to be worth fixing during busy season. World Hail Network – Absolutely the best networking site ever developed. Auto Hail Repair is always evolving and so is the terminology. If you need a word defined or know of an auto hail repair term that we should add, simply leave a note in the comment section below.